The world’s number one rainbow-riding catronaut is back to go where no cat has gone before! The countdown has already begun – so jump into the cockpit and prepare for an incredibly cute adventure! A whole galaxy of cake, cheese and candy is out there, waiting only for you to explore! – Casual, innovative action – a running game with drag-and-drop controls! 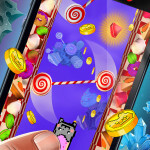 – Cute and detailed cartoonish graphics – Nyan Cat is now looking better than ever! 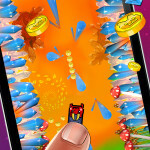 – Crazy challenges – slalom between lollipops, evade flying candies and help Nyan to reach the end of the level! – Collect coins and other goodies to get access to new features! 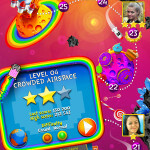 – Share your success – Nyan Cat: The Space Journey is integrated with Facebook! Challenge your friends and share your achievements with them! 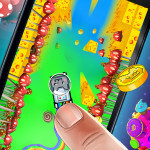 The controls are very easy to learn – just grab cute little Nyan Cat with your finger and swing him around to avoid obstacles. Let him loose and he’ll keep flying straight ahead! Cheese planets with rainbow rings, cupcake moons with lollipop satellites, mushroom asteroids spinning around smiling suns – discovering the cute and beautiful Nyan Universe will be quite an adventure! You won’t be able to stop until you explore every inch of it – and then you’ll come back for more! Log in to Facebook and watch the map turning into one huge leaderboard. Compete with your friends from level to level – grab more collectibles to become the ace. Miss someone from the list? Everyone is just a single invite away! Thank you for playing Nyan Cat: The Space Journey! 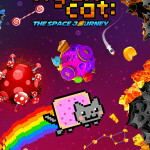 One Response to Nyan Cat: The Space Journey! I don’t know about others, but I’m a color lover, and this game is right on! Loads of colour, smooth play, and amazing graphics (images & 3D look). Everything that makes a game fun!